June marks the beginning of Winter and like 99% of the human beings out there, my skin tends to dry out and basically lose every ounce of moisture during the colder months. I’ve adopted a pretty simple skincare routine that helps my skin beat the winter blues and I thought I’d share it with you guys! My routine for both morning and night is exactly the same – body cleanser, body moisturizer and hand lotion – however the products used are different, so I thought I’d just split my routine up into the various product types. 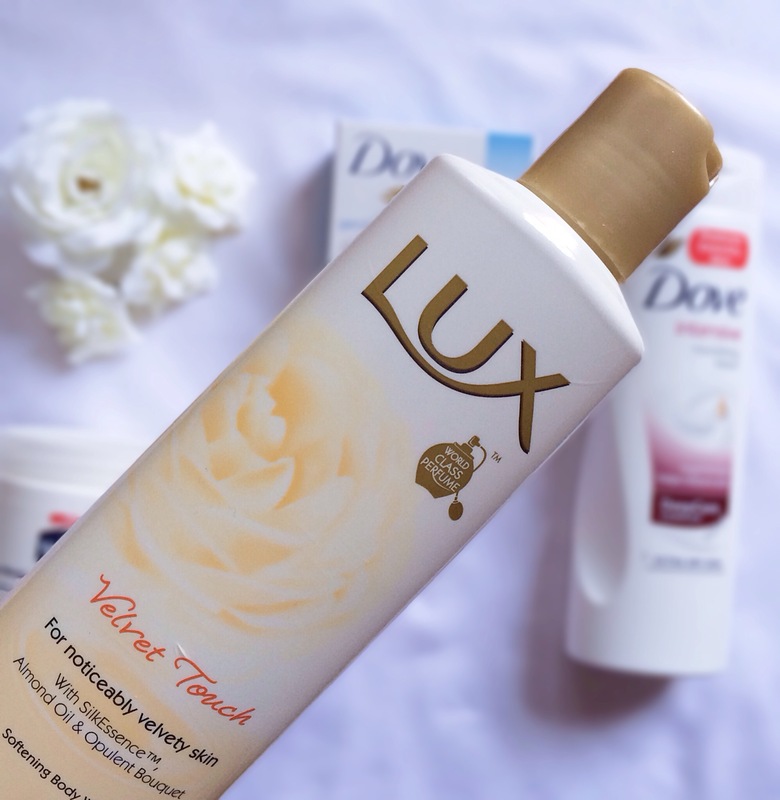 The Lux Velvet Touch Body Wash is my go-to body wash in the morning. On deciding whether it should form part of my morning routine or not, I conducted a little experiment. I used this body wash for 10 consecutive mornings and evenings without moisturizing with a body lotion afterwards. And the results were phenomenal. On the 11th day, my skin was still so soft and moisturized and I experienced no flaking or dryness whatsoever. I’m also obsessed with the scent of this body wash. After every shower, I honestly just want cover my nose with the palms of my hands and just breathe in all of that sweet scent. If I have to liken the scent to something, it probably would be to a roll of those mini, colourful sherbet-like sweets called Ziffers – it smells exactly like that! Dove’s Beauty Cream Bars have quickly become a favourite of mine. 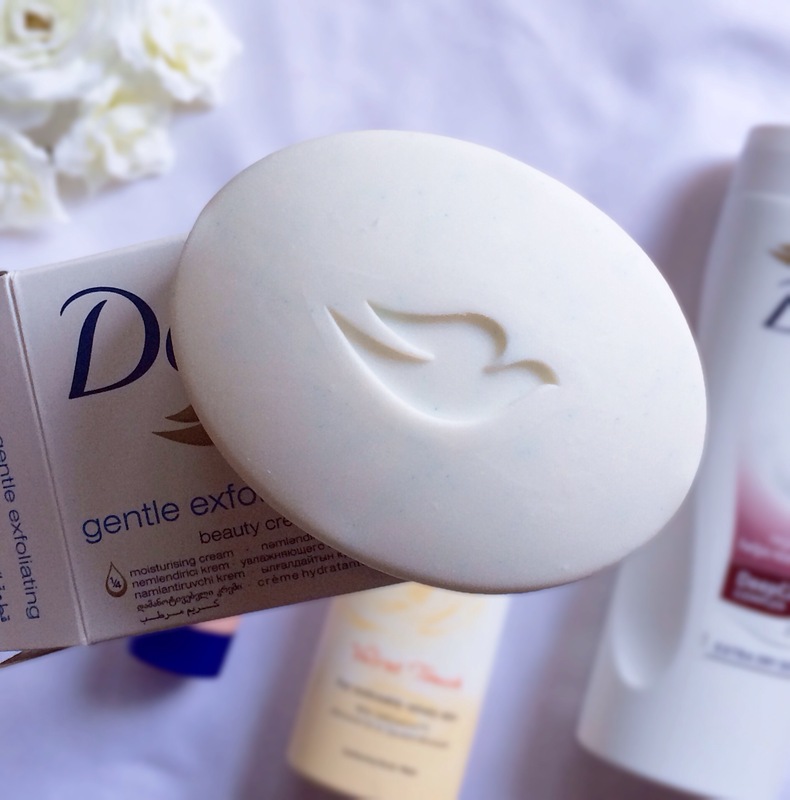 I’ve recently got my hands on Dove’s Gentle Exfoliating Cream Bar which contains micro-beads that gently exfoliates the skin whilst cleansing. I prefer using this cream bar at night because I feel that the ¼ moisturizing cream that is contained within the bar has a greater effect during the night than during the day. The exfoliating properties of this cream bar make it perfect for winter as it helps to slough off any dry skin. Oh yes, it also doesn’t hurt that it smells amazing and is quite affordable too – an exfoliating body wash would cost waaay more than this darling cream bar. 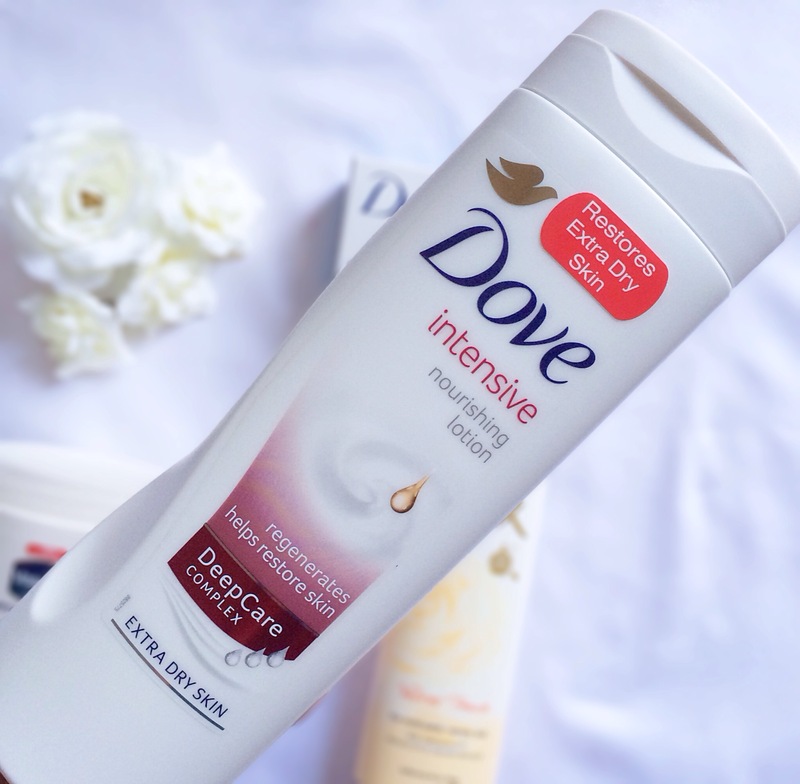 On choosing a body moisturizer for the morning, which will stay on for the rest of the day, I was looking for one that absorbs quickly into the skin, effectively moisturizes the skin and feels light and breathable and Dove’s Intensive Nourishing Lotion for Extra Dry Skin ticks all of those boxes for me. One would expect that a lotion that is formulated for Dry skin will be extremely greasy but it really isn’t. I find that within a minute of applying the lotion, it has already absorbed into the skin whilst restoring moisture and smoothness almost immediately – totally ridiculous to believe but it’s absolutely true! You know people are always saying that your skin regenerates at night and that’s why that’s the best time to use super-duper moisturizing products? 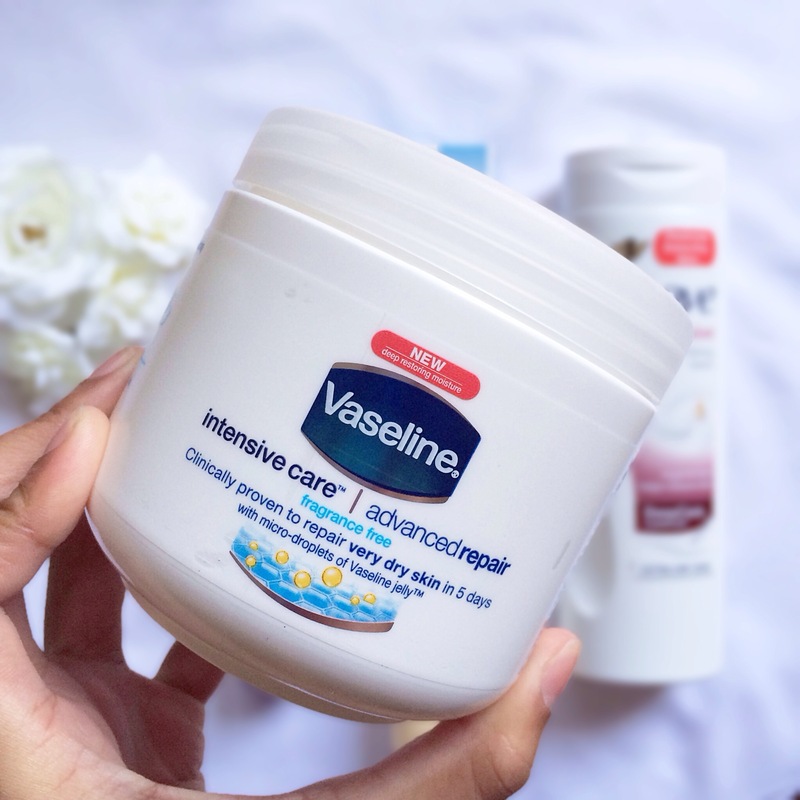 Yeah, so I heeded to that advice and incorporated Vaseline Advanced Repair’s Intensive Care body cream into my winter skincare routine. It is available in a variety of formulations, such as cocoa butter, aloe vera as well as a lightly fragranced and a fragrance-free one too, of course I opted for the fragrance-free option which, just like the other variants, is formulated with micro-droplets of Vaseline Jelly which absorbs into the skin and moisturizes from deep within. What I love about this body moisturizer is that is a cream and not a lotion i.e. it is thicker, heavier and more efficient in moisturizing the skin. The package states that it will repair even the driest of skin in just 5 days and surprisingly enough, it does. I didn’t believe that it would, so I obviously tried it out and within 3 days my elbows and knees were almost perfect. For just R34.99 a pop, it’s remarkably good! 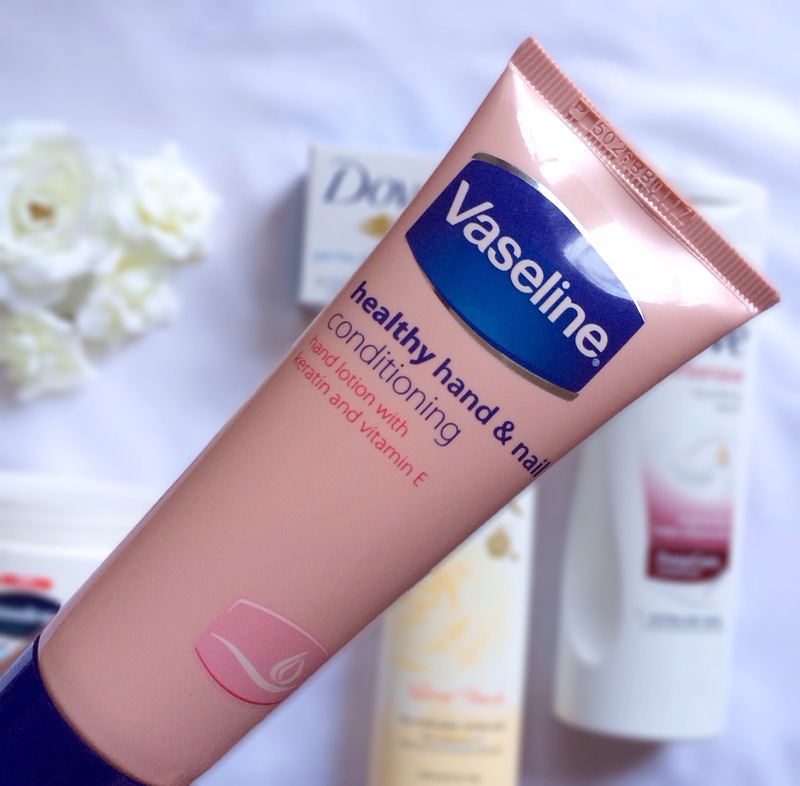 When I’m at home, I use either of the above body moisturizers as a hand lotion however, Vaseline’s Healthy Hand and Nail Lotion is in my handbag all year round, not just in winter. I’m yet to come across a hand lotion that beats this one. It smells amazing, moisturizes my hands, nails and cuticles, absorbs quickly and isn’t greasy. One tube usually lasts me about 2-3 months and at a cost between R29 – R35 it’s so affordable to replace when you’ve run out. And that’s my Winter Skincare Routine! I would suggest Avene’s Tolerance Extreme Cream (available ar Clicks) for Winter and any other time of year, it works well at moisturizing skin and getting rid of any dry/white patches. For marks, I suggest using The Victorian Gardens Lavender and Myrhh oil (if you have oily/acne-prone/senstive skin) or the Roshehip Oil (if you have normal skin). These are available online at Faithful to Nature. I will be doing a Winter Facial Skincare routine soon, so do look out for that too. If your skin isn’t sensitive, I’m pretty sure tissue oil would be okay – however, I’m not sure how long it would take so see results from it. I don’t suggest using any of the lightening creams you mentioned – if it’s made in India/pakistan, not dermatologically tested or below R70-80 for bottle containing more than 12ml of product, my advice is stay away from it – as most contain harmful and toxic ingredients. My favourite hand cream is the Avène Cold cream Hand cream. It’s amazing! It really helped my hands and smoothened out my peeling skin around my nail. Which became a nasty habit and I’d be biting and peeling all day. This really healed it and now I’m not tempted to bite anymore.